After being recognised last month at the UK Community Rail Awards, a website developed as part of the Citizens’ Rail project has received further praise – this time winning at the UK Rail Exec Most Interesting Awards. The Riviera Line website won in the Most Interesting Community Engagement Project category at the awards, held in Leicester on 29th November 2014. The award was presented by Neil Buxton, General Manager of the Association of Community Rail Partnerships to Mike Parker-Bray, Citizens’ Rail Communications Officer at the Devon & Cornwall Rail Partnership. After winter’s infamous storms, the Devon & Cornwall Rail Partnership (DCRP) wanted to harness the local feel-good factor around the re-opening of the line through Dawlish. A marketing campaign was developed to win back lost passengers and to attract non-users to try the train between Exeter and Paignton. 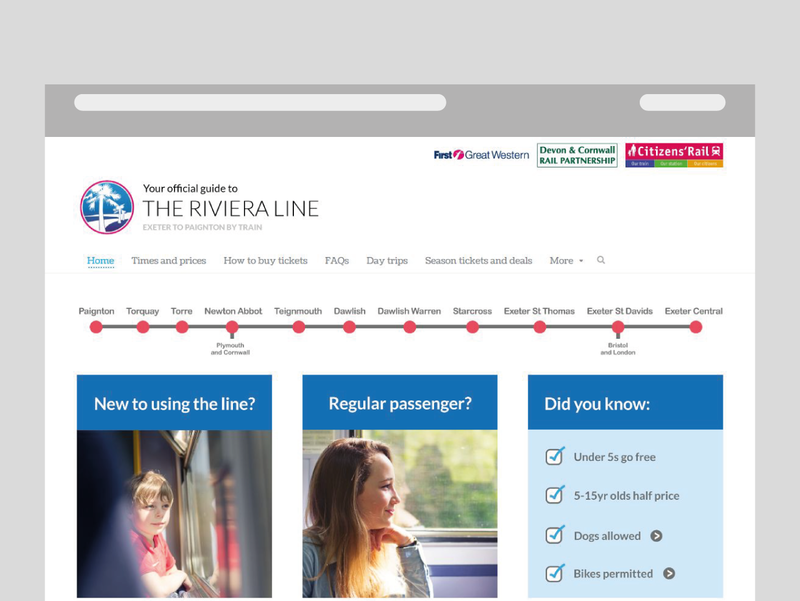 Its centrepiece was TheRivieraLine.com – a new type of community rail website, providing concise travel advice delivered in a visual, modern style. The website – launched in the first week of April 2014 to coincide with the line’s re-opening – was created as part of the EU Citizens’ Rail project, of which DCRP is the lead partner. The site is believed to be community rail’s first “responsive” website. This means its content resizes to provide a comfortable reading experience on PCs, tablets and smartphones (see screenshots provided). This is not only better for the user, but it also minimises costs for the Community Rail Partnership – who might otherwise have to fund and manage an app or separate mobile version of the website. It also future-proofs the website: with the numbers of people viewing websites on mobile devices widely predicted to grow and grow. Since its launch, one in three visits to TheRivieraLine.com has come from smartphones or tablets. The website breaks down barriers to travel by explaining the essentials in an approachable, easy-to-digest way. This ranges from how to buy tickets when travelling from unstaffed stations, to whether you can take your dog on board, to whether there are toilets on the train. The site addresses these frequently asked questions in a concise, friendly way to help non-users to try the train. This is a departure from the stuffy tone and long-winded content of some public transport websites. Every link on the website is tracked, so that over time a rich picture will develop of which types of discounted tickets are most popular and which destinations are clicked most frequently. In this way the website will become a valuable source of insights to inform future marketing: both online and offline. The site uses professional photography to put people at the heart of the story. This addresses what is arguably a common weakness of public transport websites. There are many handy rail travel tools available online, including season ticket calculators, personalised timetable creators, live departure information, car parking season ticket calculators and more. However, they are often little-known and are tucked away on a range of different websites. TheRivieraLine.com showcases them (including providing direct links to the tools) to raise their profile and help users.